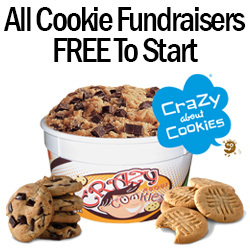 Cookie dough fundraisers are one of the most popular and fastest growing fundraising programs. We offer an incredible selection of quality cookie dough fundraisers. They are all delicious, convenient and reasonably priced for quick sales. 6 flavors, that you sell for $10 each, packaged in a 2 lb tub. Excellent price - many supporters will buy 2 or 3 tubs! 6 top flavors, PLUS a Super Size option of our #1 seller, Classic Chocolate Chunk. Affordable, delicious and super profitable. 36 gourmet cookie dough flavors and other treats, priced at $16-$18 each, for groups of 25 sellers or more. 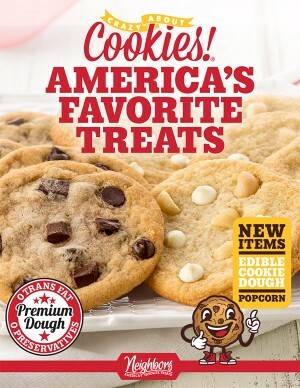 Besides preportioned cookie dough, this catalog offers your supporters edible dough, gourmet popcorn, Kenchaux white rice, beef snacks, and more! Your group also receives our FREE student pre-pack service. How Does a Cookie Dough Fundraiser Work? 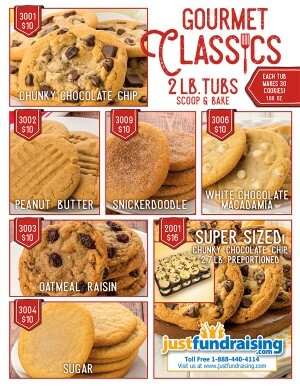 Firstly, select which of our cookie dough fundraisers you’d like to use. 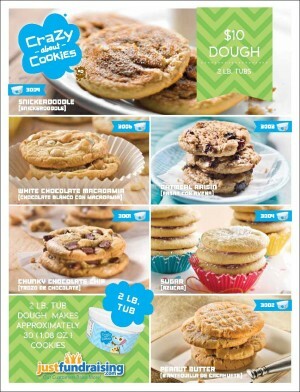 Then, order 1 free cookie dough order-taker for each of your sellers. Your group members will then ask friends, relatives, close neighbors and even work colleagues to purchase 1 or more tubs or boxes of cookie dough. They will collect all fronts up-front, and jot down the name, address and phone number of the supporter on the order-taker. After 2-3 weeks of fundraising, the group leader will collect all the order forms and funds from the participants and place one bulk order with us. Your group pays the cost for the cookie dough product and you keep the rest for profit! We’ll then ship the product to you, and your sellers will distribute the cookie dough to their supporters with a big THANK YOU! What Makes Our Cookie Dough Fundraising Programs Better? Quality Gourmet Cookie Dough: we know that great taste and superior quality is the #1 ingredient for a successful cookie dough fundraiser. From our popular peanut butter and chunky chocolate chip, to unique flavors like caramel pecan chocolate chip, M&M candies and peanut butter cup (made with Reese’s), our cookies are going to tease pallets and fill your wallet. Highest Profit GUARANTEED! Our profit varies from 30% profit to 55% profit depending on how many units your group sells. We do our best to put the money in your pockets. If another company offers better pricing on the same branded products, we’ll beat it by 5%! Lowest Order Minimums: we have the lowest order minimums in the industry. 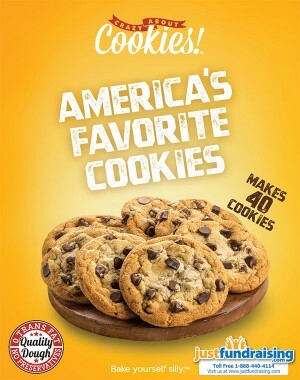 You can order as few as 86 cookie dough items, where most other companies have a minimum order of 150 to 300+ items. Free Shipping: we offer you free shipping when you order 150 items or more. So a small group of 15 sellers, selling 10 items each, will reach that level. Attractive Order-Takers: The cookie dough photos and the brochure design are developed by industry professionals. With such appeal, the cookie dough becomes such an easy sell. Convenience: our cookie dough can remain at room temperature for more than 7 days. That means that on delivery day, your sellers don’t have to pick-up and distribute the dough within 2 hours for the fear of it spoiling. Program Selection: we’ve got half a dozen cookie dough fundraisers including $10 cookie dough, prep-portioned cookie dough, dry mix cookie dough, and a collection that includes cookie dough, pretzels, cakes and more. Personal Fundraising Assistants: our team has been helping organize cookie dough fundraising campaigns for over a decade. We’ll help you find the right one for your group! FREE to Start! We’ll send you free cookie dough order-takers so you can start selling today! If you find your community is more price sensitive, try the $10 cookie dough fundraiser. Make sure each of your sellers knows how many units of cookie dough you expect them to sell. Make sure you collect all your funds up-front from your supporters. Have the sellers’ parents bring the cookie dough brochures to work for quick, easy sales from work colleagues. Looking for a cookie dough program with big brand recognition? Then check out our Otis Spunkmeyer fundraisers. Our fundraiser went very well. We ended up raising a lot more than expected, even more than we did last year. The cookie dough is great, we like that it does not need to be refrigerated immediately which makes it easy to store and distribute to our group. The brochure is also very visually attractive and makes it easy to sell. Get Your Cookie Dough Fundraiser Started Now! 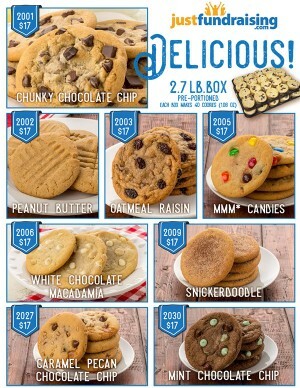 Simply choose your preferred cookie dough fundraiser online or by calling us, and we’ll send you FREE order-taker brochures for your entire group.